The talk is almost done as weigh-ins and the final pre-fight media circus seem to be slowing down in the wake of UFC 155’s year ending event, tomorrow night at the MGM Grand Garden Arena. The two men in the main event showed up for the prefight press conference and afterwards were able to answer questions with mmafighting.com’s Ariel Helwani which is primarily what’s quoted below. A quick observation of both competitors is that they seem injury free and ready to rewrite or change the script of their first meeting in the cage, depending on the outcome they earned in their first scrap in 2011 when they made history as the first UFC fight on FOX. The ball is definitely in JDS’s court since he is the champ this time and Cain already lost to him. JDS knows this and made a strong point on the matter in the interview with Helwani. With both men having been clearly injured in their last foray, and even more adamant this time of being injury free, this fight is hard to predict, regardless of the outcome of their first match. 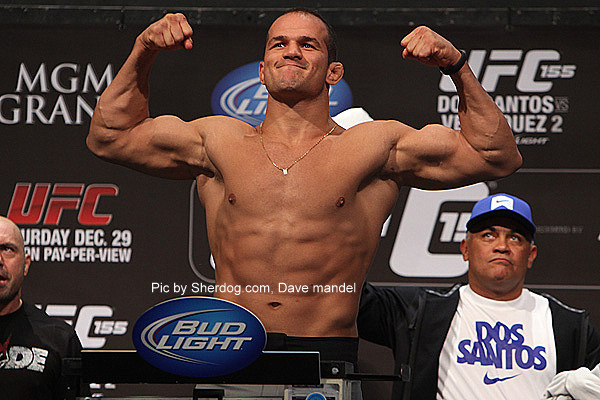 Look to see JDS drop bombs while Cain attempts to impose his stifling ground attack. Regardless of the outcome tomorrow night, the fans will be the true winners. Watch the recent weigh-in highlight of the two baddest dudes on the planet in the video below.